Archeometric objects are unique and very sensitive to changes in their consistency. This must be taken into account when examining them. Their examination is necessary for the preparation of their restoration and for understanding the technologies of their manufacture. For this purporse,only small parts of the object are usually analyzed. Especially for elemental analysis, micro X-ray fluorescence is a fast and frequently used analytical method that permits sensitive and non-destructive examination. 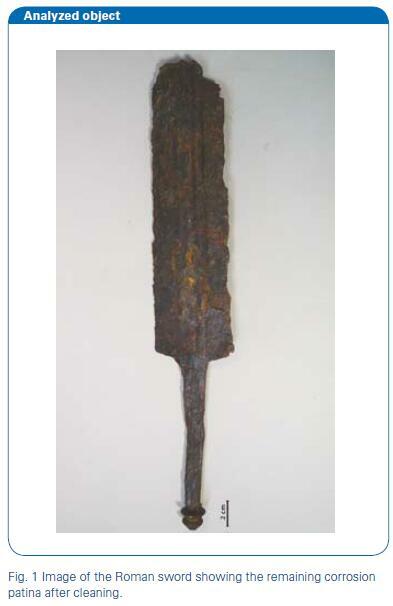 The examined object is a Roman sword of a type called Gladius (see Fig. 1). It was found in the north-east of Germany,close to the town of Pasewalk. Several manufacturing features indicate that the sword was not manufactured in this region. It was most likely carried by Germanic warriors,who broke it and sacrificed it to the gods. The sword was highly corroded. The first examination step took place at the University of Applied Sciences HTW Berlin (Hochschule für Technik und Wirtschaft Berlin), where X-ray imaging analysis was performed on the sample. 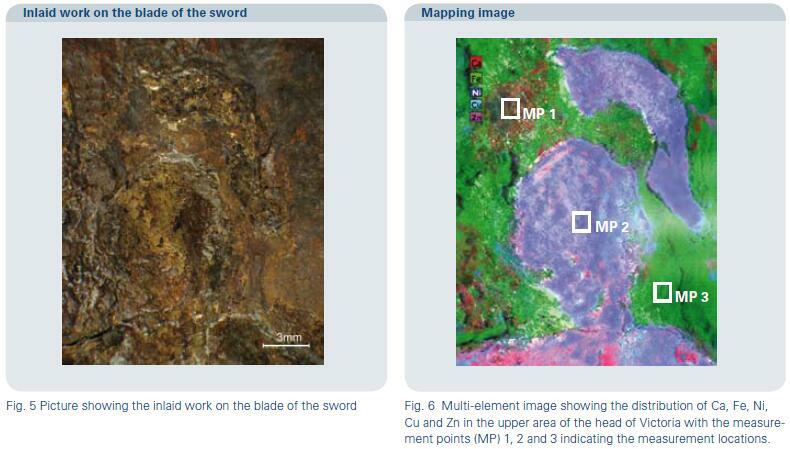 Figure 2 (left) shows a sandwich structure of carbon rich and cabon poor regions in the upper part of the sword. 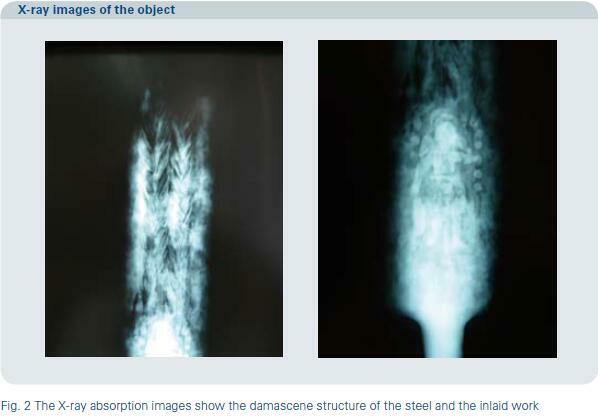 This is known as damascene steel, a steel type that combines hardness with elasticity. 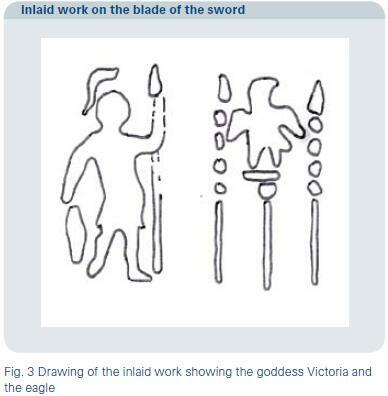 The X-ray image of the area close to the handle shows two pieces of inlaid work, one on each side of the blade as it can be seen in figure 2 (right). The inlaid work shows on one side Victoria, the flying goddess of victory and the tuary goddess of the Roman emperor. On the other side of the blade is an eagle, the symbol of the Roman legion (see Fig. 3). From this point on, the examination focused on the elemental composition of the inlaid work and the blade, as well as on the reconstruction of the shape of the inlaid work by using an elemental imaging system. The results of the distribution analysis are presented in figure 4. The small mapped area shows the shape of the head of Victoria. The inlaid work seems to be made of a Cu-Zn-alloy containing Ni; as expected, the blade is made of steel. 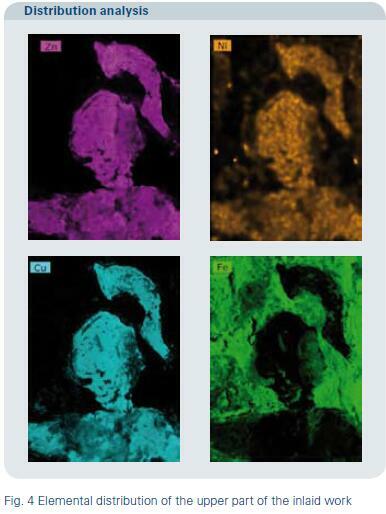 Single spectra were accumulated of different locations on the inlaid work (see figure 6). The HyperMap function permits to summarize the spectra of several pixels with the same composition. The measured locations are highlighted on the mixed image of all detected elements. Sensitive and valuable archaeological objects can be easily and reliably analyzed with μ-XRF. This technique permits a fast non-destructive analysis of collection objects, especially on small sample areas. The analyzed Roman sword is made of low alloyed steel. Ithas inlaid work showing the goddess of victory. The spectral analysis gives an estimation of the elemental composition of both the steel of the sword and the inlaid work. It also indicates that a careful spectral analysis is necessary for the correct interpretation of the elemental distribution. This is the only way to identify overlaps or background effects correctly.The shape of the inlaid work can be recognized with very high detail on the element mapping image, allowing the reconstruction of the object shape without further preparation.The calculated composition values are crucial for the correct restoration of the object, since the technology chosen for the restoration works is highly dependent on the composition of the sample.